The flavor and texture of rose apples surprises me nearly every time I try one. The outside skin is naturally waxy and can reach a deep red hue, which might lead you to expect an apple-like chewing experience. But as you bite in you'll be rewarded with a burst of juice that is incredibly satisfying if you're thirsty (more like a watermelon than an apple). Mixed into that bite are overtones that smell and taste mildly of roses, but not in an unpleasant way. The overall flavor is only mildly sweet, but usually enjoyable. The texture, although not as substantial as a true apple, is a bit reminiscent of them. There's virtually no core inside, which means you can pretty much eat straight through the fruit. The level of sweetness in them varies, but overall rose apples are on the lower end of the sweetness scale. Unfortunately, rose apples are one of those fruits that don't ship well. The skin is extremely fragile and even small bumps will break or bruise the flesh. This pretty much means you have to come to the tropics or subtropics to try some. In the continental United States rose apples can grow in Southern Florida and Southern California, and you may be able to find them at farmer's markets. Production is not guaranteed, though, as a single frost or lack of water can kill them off. Hawaii is probably the place in the US where you can most easily find them. In Hawaii's forests you can stumble on rose apples growing wild, and it's a common pastime for people in the know to go foraging for them. Farther abroad they're common in tropical regions with sufficient rainfall, including just about all of Southeast Asia. If you're eating a healthy raw food diet, rose apples can fit in nicely. You'll need to eat a large amount of them to meet the caloric requirements for a meal, however. They also work well as between-meal snacks. The reason they're so low in calories is that they're 91.6 percent water. A date, for comparison, is roughly 20 percent water, and iceberg lettuce is 95.6 percent water. Just be awareso don't undereat severely and cause craving problems. The English name Rose Apple is usually applied broadly to four fruits belonging to genus Syzygium. They share similar tastes and textures, but have significant differences between them. Here's what it comes down to, in my experience. Roughly the size of a cherry and often shaped like a bell. I've seen them only them in red, but some Indonesians I've met insist it can also be yellow. I'm not sure if they're confusing it with Syzygium Jambos, or if it's yellow when it's unripe. 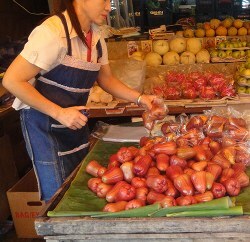 Water Rose Apple, Water Cherry, Water Apple, Lau Lau, Watery Rose Apple, Bell Fruit. I've never seen this one in a market, but I've found them in the wild and on small farms. The flesh tends toward pale yellow with hints of red. Some of them are shaped a bit like mangosteen. 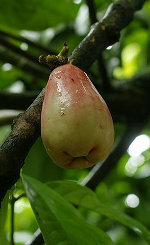 Indonesia: Darsana, Jambu Tersana, Djamboo Bol. These two are the most commonly grown, and easiest to find in Asian markets. 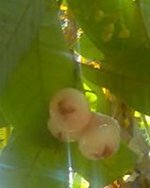 They look fairly similar but Syzygium Malaccense is a bit smaller than Samarangense, with less distinct "ridges". Malaysian: Jambu Air "Water Guava"
See how rose apples fit in among the awesome fruits available to you on a raw food diet. Make amazing and tasty raw dressings and sauces.